Grace Kennedy shares traded at a 52 weeks’ high on Monday. 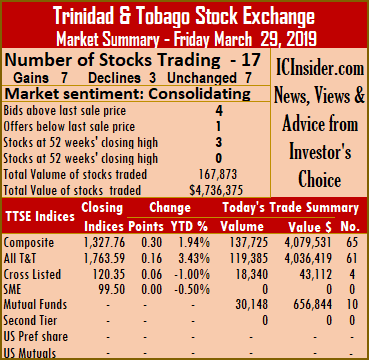 Three securities closed at 52 weeks’ high in trading on the Trinidad & Tobago Stock Exchange on Monday, similar to the number on Friday. Volume traded was less than on Friday with substantially less monetary consideration as 12 securities changed hands, against 17 on Friday with investors exchanging 145,498 shares for $2,183,458, compared to 167,873 shares at $4,736,375 on Friday. At close of the market, 6 stocks advanced, 3 declined and 3 remained unchanged, leading the Composite Index to rise 1.93 points to 1,329.69. 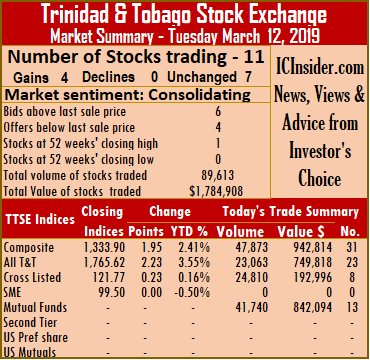 The All T&T Index gained 4.80 points to end at 1,768.39, while the Cross Listed Index shed 0.14 points to close at 120.21. IC bid-offer Indicator| The Investor’s Choice bid-offer ended at 3 stocks with bids higher than their last selling prices and 3 with lower offers. At the close of the market, stocks ending trading with gains| Clico Investments gained 35 cents and closed at a 52 weeks’ high of $22.50, with 2,800 stock units changing hands, Grace Kennedy finished 5 cents higher at a 52 weeks’ high of $3.30, exchanging 43,215 stock units. Guardian Holdings rose 25 cents and completed trading with 260 units at $18.25, Prestige Holdings added 2 cents and completed trading of 1,453 units, at $7.62. Republic Financial Holdings increased 92 cents and settled at $119.92, in exchanging 8,610 shares and Trinidad & Tobago NGL rose 23 cents and completed trading of 2,282 units at a 52 weeks’ high of $30.50. Stocks closing losses| JMMB Group fell 2 cents to end at $1.78, after exchanging 15,750 shares, Massy Holdings closed with a loss of 35 cents to close at $53.05, trading 10,706 shares and Sagicor Financial shed 15 cents in closing at $8.65, with an exchange of 1,100 shares. 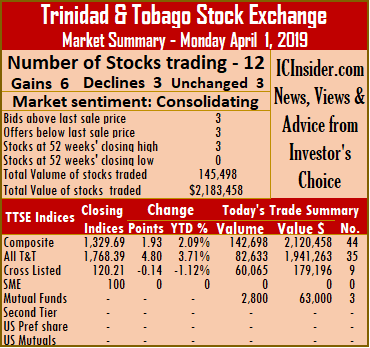 Stocks closing firm| First Citizens settled at $36, after exchanging 145 shares, One Caribbean Media concluded trading at $10.30, after exchanging 12,500 shares and Trinidad Cement settled at $2.55, after trading 46,677 shares. 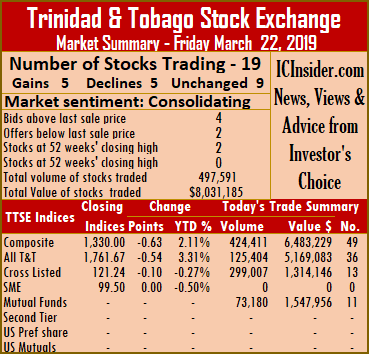 Securities trading on the Trinidad & Tobago Stock Exchange on Thursday rose to 17, compared to 13 on Wednesday but with a reduction in volume and value passing through the market. 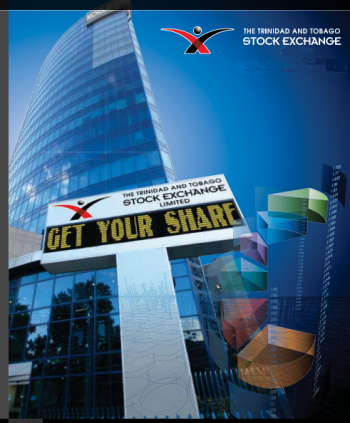 Trading resulted in an exchange of 117,680 shares at $4,566,233 crossing the market, compared to 2,054,838 shares at $8,221,178 changing hands on Wednesday. At close of the market, with 3 stocks advancing, 7 declining and 7 remaining unchanged, leading the Composite Index down 1.59 points to 1,327.46. 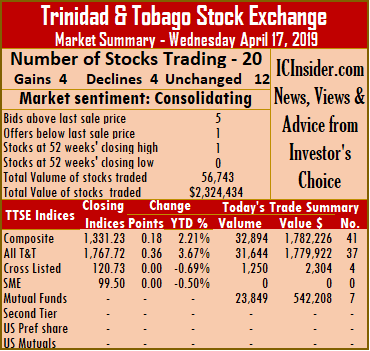 The All T&T Index lost 0.52 points to 1,763.43, while the Cross Listed Index shed 0.37 points to close at 120.29. At the close of the market, stocks ending trading with gains| First Citizens rose 5 cents and settled at 52 weeks’ closing high of $35.75, in exchanging 50 shares, Republic Financial Holdings added 24 cents to close at $119, with 20,718 shares traded and West Indian Tobacco increased 10 cents and ended at $96.16, with 1,409 stock units changing hands. Stocks closing losses| Grace Kennedy fell 2 cents and ended at $3.25, with 4,425 stock units changing hands, Massy Holdings closed with a loss of 10 cents at $53.40, after exchanging 976 shares, National Enterprises shed 50 cents and ended at a 52 weeks’ low of $7.25, with 2,146 stock units changing hands, One Caribbean Media lost 10 cents and ended at $10.30, after exchanging 6,500 shares. Sagicor Financial exchanged 1,700 shares and lost 10 cents to close at $8.70, Scotiabank concluded trading of 1,599 stock units with a loss of 2 cents in ending at $63.51 and Trinidad & Tobago NGL traded with a loss of 50 cents at $30.50, with 31,753 units changing hands. 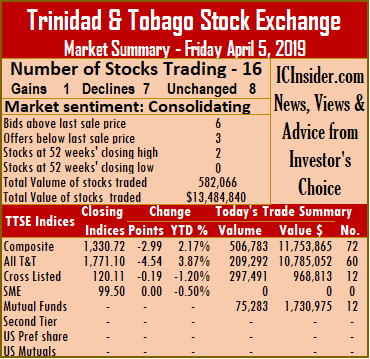 Stocks closing firm| Ansa Mcal completed trading of 495 units, at $55.24, Calypso Macro Index Fund traded 170 shares at $14.45, Clico Investments ended at $22, with 9,420 stock units changing hands. 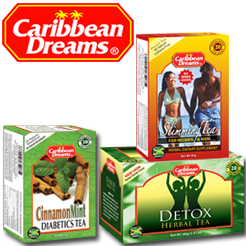 Guardian Holdings completed trading of 25,000 units at $18.25, JMMB Group closed at $1.80, after exchanging 8,330 shares, NCB Financial Group settled at $8.25, after trading 2,620 shares and Unilever Caribbean closed at $26, in exchanging 369 shares. 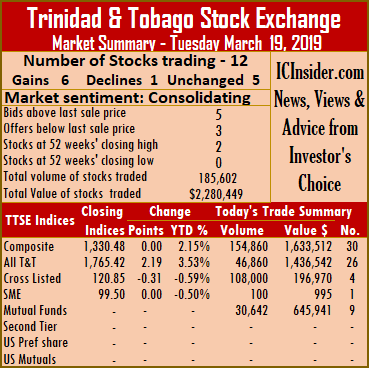 Market activity on Tuesday ended with 12 securities trading on the Trinidad & Tobago Stock Exchange against 13 ended on Monday, with 6 advancing, 1 declining and 5 remaining unchanged. 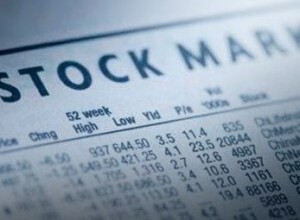 At close of the market, the Composite Index remained unchanged at 1,330.48 points. 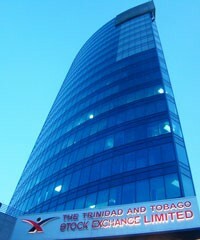 The All T&T Index rose 2.19 points to 1,765.42, while the Cross Listed Index fell 0.31 points to close at 120.85. Trading resulted in 185,602 shares at a value of $2,280,449 changing hands, compared to 306,902 shares valued $6,299,870, on Monday. At the close of the market, stocks ending trading with gains|Clico Investments finished 30 cents higher to close at a 52 weeks’ high of $21.10, with 30,442 stock units changing hands, First Citizens concluded trading of 32,094 shares with a gain of 1 cent to close at $35.52. 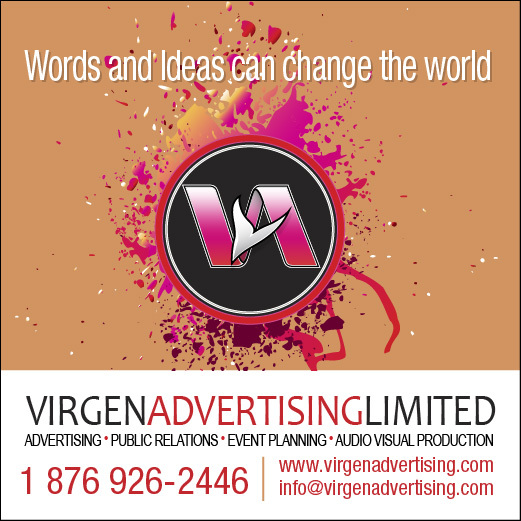 Massy Holdings gained $1 and ended at a 52 weeks’ high of $53, after exchanging 1,140 shares, One Caribbean Media added 40 cents and ended at $10.40, trading 675 shares, Scotiabank increased 1 cent and completed trading at $63.52, with 77 stock units changing hands and Trinidad & Tobago NGL rose 6 cents and settled at $30.06, with 6,944 units trading. Stocks closing losses|Sagicor Financial concluded trading with a loss of 35 cents at $8.65, after exchanging 1,000 shares. Stocks closing firm|Calypso Macro Index Fund traded 200 shares to close at $14, CinemaOne traded 100 stock units at $9.95, JMMB Group ended at $1.76, after exchanging 107,000 shares, National Flour settled at $1.65, with 4,930 units trading and Prestige Holdings settled at $7.55, with 1,000 units changing hands. 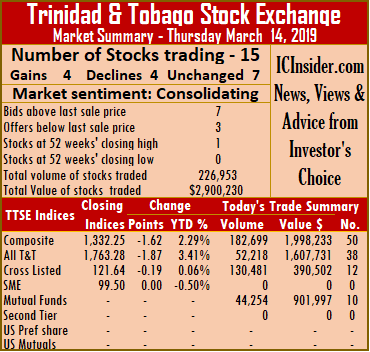 Market activity on the Trinidad & Tobago Stock Exchange ended on Thursday with 14 securities trading versus 13 on Wednesday. The market close with the prices of 4 stocks advancing, 4 declining and 7 remaining unchanged. At close, the Composite Index lost 1.62 points to 1,332.25. The All T&T Index shed 1.87 points to 1,763.28, while the Cross Listed Index fell 0.19 points to close at 121.64. Trading ended with 226,953 shares at a value of $2,900,230, compared to 391,682 shares at a value of $8,847,624 on Wednesday. IC bid-offer Indicator| The Investor’s Choice bid-offer ended at 7 stocks with bids higher than their last selling prices and 3 with lower offers. At the close of the market, stocks ending trading with gains| Calypso Macro Index Fund, traded 2,300 shares and rose 38 cents to close at $14, Clico Investments finished 60 cents higher and ended at $20.80, with 41,954 stock units changing hands. 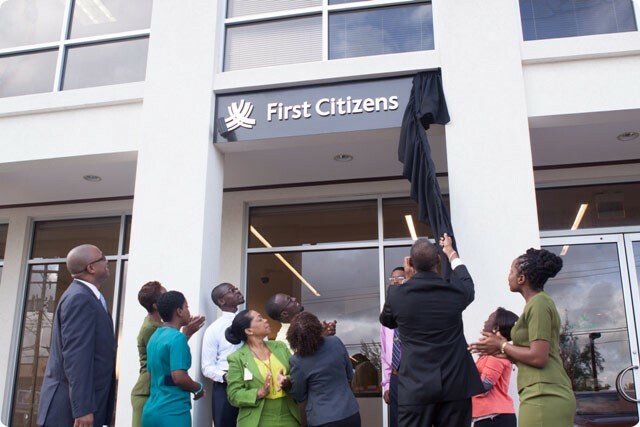 First Citizens rose 5 cents and settled at a 52 weeks’ high of $35.55, after exchanging 1,296 shares and Trinidad & Tobago NGL added 1 cent and completed trading of 26,809 units at $30. Stocks closing losses| Guardian Holdings concluded trading of 635 units with a loss of 50 cents to close at $18.50, JMMB Group fell 2 cents to end at $1.76, after exchanging 106,038 shares. 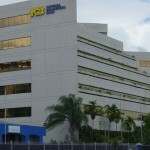 NCB Financial Group declined 4 cents and settled at $8.35, after trading 1,100 shares and Unilever Caribbean closed with a loss of 45 cents at $26.05, after an exchange of just 8 shares. 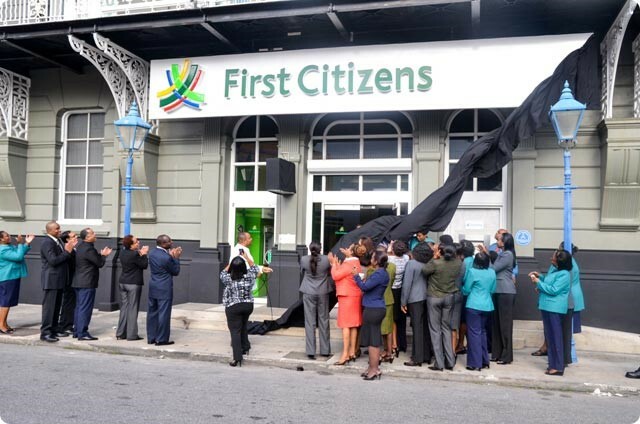 Stocks closing firm| First Caribbean International Bank completed trading of 22,000 units at $8.35, Grace Kennedy ended at $3.25, with 195 stock units changing hands, National Flour completed trading with 4,907 units at $1.65, One Caribbean Media closed at $10, after exchanging 8,743 shares. Republic Financial Holdings settled at $120, after trading 445 shares, Sagicor Financial ended at $9, after exchanging 1,148 shares and Scotiabank ended at $63.59, with 9,375 stock units changing hands. First Citizens closed at a 52 weeks’ high on TTSE on Tuesday. 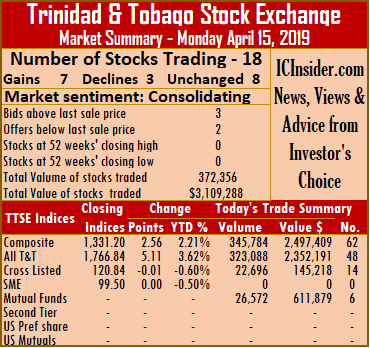 Market activity on the Trinidad & Tobago Stock Exchange ended on Tuesday with no stock declining but with 11 rising versus 13 on Monday. The market close with the prices of 4 stocks advancing and 7 remaining unchanged. At close, the Composite Index rose 1.95 points to 1,333.90. 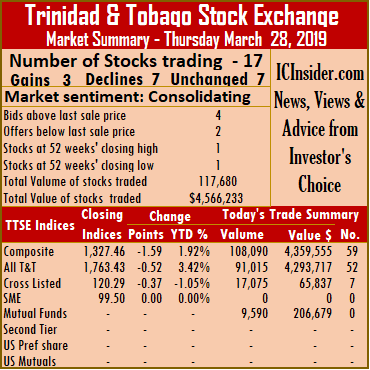 The All T&T Index gained 2.23 points to 1,765.62, while the Cross Listed Index rose 0.23 points to close at 121.77. 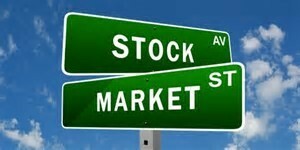 Trading ended with 89,613 shares at a value of $1,784,908, compared to 153,692 shares on Monday valued at $2,280,690. IC bid-offer Indicator| The Investor’s Choice bid-offer ended at 6 stocks with bids higher than their last selling prices and 4 with lower offers. At the close of the market, stocks ending trading with gains are| Clico Investments concluded trading 3 cents higher, at $20.19 with 41,580 stock units changing hands, First Citizens added 40 cents and settled at a 52 weeks’ high of $35.50, after exchanging 4,875 shares. Sagicor Financial increased 30 cents and ended at $9, in exchanging 12,878 shares and Trinidad & Tobago NGL rose 10 cents and completed trading of 3,855 units at $30.15. Stocks closing firm| Calypso Macro Index Fund closed at $13.62, after exchanging 160 shares, JMMB Group closed at $1.75, in exchanging 3,542 shares, NCB Financial Group settled at $8.39, after trading 8,390 shares, One Caribbean Media closed at $10, after swapping 10,130 shares. 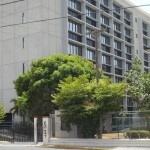 Prestige Holdings completed trading of 489 units, at $7.55, Scotiabank ended at $63.59, with 30 stock units changing hands and West Indian Tobacco ended at $96.02, trading 3,684 stock units.